By Sarah Reilly | November 22, 2011. Liberties ladies visited the afterschool club in Scoil San Seamus recently for an evening of storytelling. Throughout the evening, Sheila O’Reilly (74), Ethna O Gorman (70’s) Josie Sheehan (73), Agnes Mc Sherry (70’s), Maureen O Farrell (80), Eileen Burns (78) and Ena Mc Cormack (68) shared tales of their youth and being brought up in the Liberties. Reminiscing on technology or lack thereof when she was young Josie Sheehan said; “We didn’t have Television, our thing was reading”, to which the children’s response was utter shock. One young lad asked the ladies if they used the internet when they were kids to which Josie Sheehan replied; “The only net I ever seen was the one on my mother’s head”. She went on to share fond memories of favourite pastimes; “Songs we sang while playing ball included ‘pounds, shillings and pence’. Another was ‘You called me this, you called me that, you called me a big fat pussycat’ and ‘When I’m dead I’d be happy if I had that crust of bread’.” It was only when Ms. Sheehan rhymed off her rendition of ‘Sticks and stones will break my bones but names will never hurt me’, that the kid’s uncertain faces became more accustomed. “At tea time everyone sat around the table and got and bread jam….there was no such thing as being brought to Mc Donald’s”, Josie Sheehan explained having been enthusiastically questioned by the children about meal times. Eileen Burns added that her childhood supper usually consisted of bread and dripping, to which the kids uncertain expressions again became apparent. Maureen O Farrell was asked by one young boy if she walked to school as a young girl. “I walked four and a half miles to school and four and a half miles home so that’s nine miles day”, she replied, to which the schoolboys solemnly responded in harmony saying “why why why”. “The lot of us had to leave school at fourteen”, added Agnes Mc Sherry. One pupil enquired about the ladies childhood hobbies and was a little taken aback by Josie Sheehan’s reply; “We sold jam jars to get the price of a cinema ticket”. Reece Gibbons asked the women if they used a washing board in the olden days. The ladies, shocked by the young boy’s enquiry asked him how he knew about washing boards. Reece confidently replied; “Well I live in the tenements”. Laughter broke out among the Scoil San Séamus guests when a young pupil asked whether the ladies had any close relations in the famine. Giggling amongst themselves the women cried out “We are not that old”. “How do you feel about getting old?” added a young lad soon after, to which the women replied again in unison; “We’re not that old”. After the ladies shared stories of dancing in their day, three of the children confidently performed the modern shuffle dance to the ladies delight. The hour flew and was enjoyed by all after which it was time for the students to get back to their desks and work on their homework in the afterschool club. With a cup of tea in hand, Agnes Mc Sherry said; “I found the kids very attentive and thought they asked really good questions…When I showed them the book on what we used to play when we were kids they loved it”. 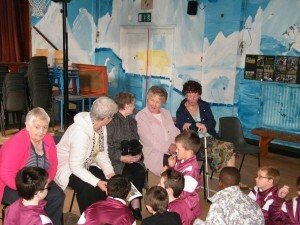 Sheila O Reilly said she thoroughly enjoyed the visit. “Some of the questions knocked me for six”, she said. She highlighted one question in particular from one of the youngest boys who asked if the ladies had known their grandparents growing up. “I just thought maybe he has no granny or granddad!” She felt she could relate to him as Sheila had only ever known one of her grandmothers.